Prepared by Beth Ann Choate, Graduate Research Assistant; Frank Drummond, Professor of Insect Ecology/Entomology; and David E. Yarborough, Extension Blueberry Specialist, the University of Maine, Orono, ME 04469. February 2008. This fact sheet was funded in part by the Maine Agricultural Center. The Allegheny mound ant, Formica exsectoides Forel, is native throughout eastern North America from Nova Scotia to Georgia. Colonies form thatched, bare mounds that are common throughout Maine wild blueberry fields, open forested areas, and old-field habitats. 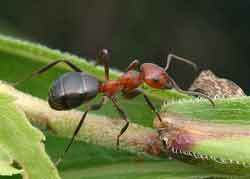 During the summer months, ants are voracious predators feeding on pest populations damaging the surrounding vegetation. Mounds are noticeable throughout a variety of habitats, especially in areas lacking tall vegetation that may shade the colony from sunlight. Workers remove all vegetation from the top of the mound and surrounding area by formic acid injection. The mound serves as a solarium, collecting heat from direct sunlight to warm the colony. Mounds are composed of coarse sand and often covered in one to two inches of thatch. This layer of thatch may serve to protect the mound from extremes in weather conditions. 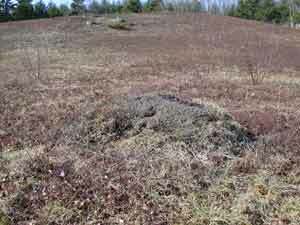 Measurements of several mounds in Maine wild blueberry fields indicate a diameter of one to four feet, with heights ranging between 0.5 and 2.5 feet. The literature indicates mounds can reach a diameter of 15 to18 feet and to a height of 3.5 feet. Nest diameter may be used to estimate the number of individuals within a colony: if 6” to 18” from 500 to 3,000; 18” to 36” from 1,000 to 6,000; and if 36” to 60” then 3,000 to 10,000 ants could be present. Allegheny mound structure in wild blueberry field. A single Allegheny mound ant colony may contain one or many queens. Both workers and queens have a reddish-orange head and thorax and black abdomen and legs. Workers vary in size from 1/8 to 1/4 of an inch long, while queens are larger, ranging in size between 3/8 and 1/2 inches long. The complete life cycle of an Allegheny mound ant, from egg to adult, ranges from 2 to 3 months, depending upon soil temperatures. In Maine wild blueberry fields, workers and queens hibernate in burrows deep below the mound from mid-October to mid-May. As temperatures increase in the spring, colonies become active, building up the mound and removing vegetation from the surface. Small, white elliptical eggs are found within the mound around mid-June. Eggs hatch in 2-4 weeks revealing white, legless larvae. Larvae are completely dependent upon foraging workers for food and survival. Workers collect a variety of small insects and other arthropods such as spiders, daddy longlegs, etc. from areas surrounding the mound, which are within a 50 to 100-foot radius in blueberry fields, to feed their larvae. Larval development takes approximately 3 to 7 weeks. Upon completion of the larval stage, pupae are formed and remain within the pupal stage for approximately 2 weeks. Adults emerge as new workers and are much lighter in color than the older workers. Queens produce several batches of eggs throughout the summer months. Activity decreases in September as the queen ceases to lay eggs and workers and queens move deep into the mound. Allegheny mound ants have been observed scavenging upon honeydew produced by aphids and leafhoppers, dead vertebrates and arthropods, and seeds; and preying upon most small arthropods they encounter. Workers can effectively control insect pests within jack pine stands, preying upon various stages of redheaded pine sawfly, jack pine budworm, gypsy moth, and white pine weevil. In wild blueberry fields, ants have been observed preying on caterpillars, beetles, treehoppers, leafhoppers, grasshoppers, crickets, wasps and flies. Specific pest insects that are preyed upon in Maine wild blueberry fields include red striped fire worm, blueberry flea beetle larvae and pupae, blueberry leaf beetle, and grasshoppers. The Allegheny mound ant plays a vital role in preying upon pest species in a variety of ecosystems, from home gardens to small vegetable and fruit cropping systems. The negative impacts of these colonies are the destruction of blueberry rhizomes and shoots in the immediate vicinity of the mound, but this is minor compared to the large benefit of pest control that is provided by the ants. To encourage populations of mound ants, it is important not to let fields become overgrown with tall vegetation that may block sunlight. Mounds act as solaria to capture heat in the early spring for incubation of ant brood. Research has demonstrated that colonies in shaded areas have a low probability of survival. However, some vegetation other than wild blueberry is essential to support honeydew-producing insects which are one of the major energy sources for the foraging workers. Honeydew-producing insects are not pests of wild blueberry in Maine; therefore, weeds that serve as a host plant for these insects are important in supplying these ants with necessary carbohydrates for energy. The spraying of insecticides in wild blueberry fields can negatively impact the prevalence of colonies. This may be one reason, in addition to the weed diversity and abundance, which organic fields tend to have more mounds than more intensively managed conventional fields. Insect pest control measures detrimental to ant workers include the application of the insecticides phosmet and spinosad, while other insecticides such as methoxyfenozide, and the biological control fungus, Beauvaria bassiana affect the ants much less and should be used if ant conservation and enhancement of natural control agents is desired. Conservation of this species is dependent upon areas with ample insect prey to sustain a colony, early successional vegetation that allows sunlight penetration to the ground surface, and the selection of least toxic insecticides for pest management.